There is a song Jews sing every Hanukkah called “Who can retell” whose lyrics also applies to the birth of Israel 70 years ago. “Who can retell the things that befell us, Who can count them?, In every age, a hero or sage, Came to our aid.” For the birth of modern Israel, the Hero who arose was the American President Harry S Truman. Beginning at sundown, Wednesday evening April 18th Israel will celebrate her 70th anniversary (by the Hebrew calendar) of the modern state of Israel. On that day the world saw a real miracle from God. After a wait of almost 1,900 years, the Jewish people who never totally left the land given to them by the Lord once again had political control of their country. 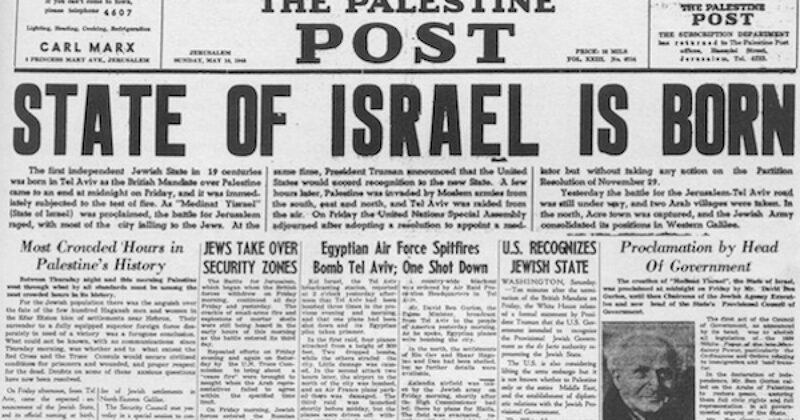 They were once again a nation-state, Israel declared her independence. 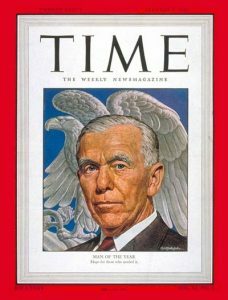 The Jewish State’s existence would have been very short-lived were it not for the strong will of President Harry S Truman, who became the first world leader to recognize Israel, and he did so over the objections of his Secretary of State George Marshall, who was much more popular with the American people than President Harry S Truman, who at that point was never elected to the Oval Office, he was the VP who took over when FDR passed away. Based on the Democratic Party’s move away from support of the Jewish State over the past decade, it may be reasonable to believe that if Harry Truman tried to overrule the popular Marshall today, the Democratic party of Barack Obama, Keith Ellison, and the Farrakahn supporting Congressional Black Caucus might try to impeach their own president. At the very least they would certainly vehemently object. The Democrats might even have tried to negate the UN Partition Plan, as most in the State Department recommended to Truman in 1948, but a wishy-washy move like that wasn’t Harry Truman’s style. The argument used by the state department leaders were similar to the ones Democrats used when Speaker Boehner invited Benjamin Netanyahu to speak to Congress about the Iran deal. Undersecretary of State Lovett first argued Truman was supporting Israel solely for political gain and he warned the President the move would lose more votes than it would gain. When that didn’t work, Lovett tried another approach –the red scare (because you know all of those Jews are commies). Mr. President, to recognize the Jewish state prematurely would be buying a pig in a poke. How do we know what kind of Jewish state will be set up? We have many reports from British and American intelligence agents that Soviets are sending Jews and Communist agents into Palestine from the Black Sea area. Lovett chirped in by accusing Truman of only trying to get the Jewish vote (a charge that angered Truman to his dying day). “It would be highly injurious to the United Nations to announce the recognition of the Jewish state even before it had come into existence and while the General Assembly is still considering the question. Furthermore, such a move would be injurious to the prestige of the President. It is obviously designed to win the Jewish vote, but in my opinion, it would lose more votes than it would gain.” Lovett had finally brought to the surface the root cause of Marshall’s fury – his view that the position I presented was dictated by domestic political considera­tions, specifically a quest for Jewish votes. “If you follow Clifford’s advice and if I were to vote in the election, I would vote against you. Everyone in the room was stunned. Here was the indispensable symbol of continuity [from FDR] whom President Truman revered and needed, making a threat that, if it became public, could virtually seal the dissolution of the Truman Administration and send the Western Alliance, then in the process of creation, into disarray before it had been fully structured. Marshall’s statement fell short of an explicit threat to resign, but it came very close.General Marshall’s position was grossly unfair. But Truman’s mind was made up– he was going to do the right thing. At 4 p.m. Friday, May 14, 1948, just before the start of the Jewish Sabbath, David Ben Gurion read a 979-word declaration of independence in front of a small audience at the Tel Aviv Art Museum. He finished in his usual terse manner. “The state of Israel is established! The meeting is ended.” (see video below). A few hours later, at midnight, British rule over Palestine lapsed–11 minutes later White House spokesman Charlie Ross announced U.S. recognition. At our last meeting, after a very interesting talk, just before [the President] left me – it was in a New York hotel suite – I told him that as a foreigner I could not judge what would be his place in American history; but his helpfulness to us, his constant sympathy with our aims in Israel, his courageous decision to recognize our new state so quickly and his steadfast support since then had given him an immortal place in Jewish history. As I said that, tears suddenly sprang to his eyes. And his eyes were still wet when he bade me goodbye. I had rarely seen anyone so moved. I tried to hold him for a few minutes until he had become more composed, for I recalled that the hotel corridors were full of waiting journalists and photographers. He left. A little while later, I too had to go out, and a correspondent came to me to ask, “Why was President Truman in tears when he left you?” I believe that I know. These were the tears of a man who had been subjected to calumny and vilification, who had persisted against powerful forces within his own Administration determined to defeat him. These were the tears of a man who had fought ably and honorably for a humanitarian goal to which he was deeply committed. These were tears of thanksgiving that his God had seen fit to bless his labors with success. Truman was a president who judged not whether things would make America popular in the Arab world, but whether it was the right thing for the US. The man from Independence, Mo. knew the best thing for America’s future was for to grab the moral leadership position of the entire world. American didn’t have that for eight years under Obama but appears to have regained it with Donald Trump. Over the last decade, the party of Truman, the Democratic Party forgot the role of Harry Truman in the Creation of Israel.Their last President was not a friend of Israel, and their losing nominee in 2016 was also unfriendly to the Jewish State. In 2012 they removed (and never replaced) a provision in their platform that prevented Israel from being destroyed by an influx of Palestinian Muslims. They also removed and never replaced a plank promising not to deal with the terrorist Hamas until they reformed. The Democrats shoved through a treaty with Iran that leaves the terrorist state less than five months away from having nuclear weapons. The Most recent Democratic Party nominating convention was an anti-Israel hate-fest And after the convention the party appointed an anti-Semitic, anti-Israel, friend of the Muslim Brotherhood terror groups, named Keith Ellison as their number two guy, and one of their vice-chairs threatened people who protested against an anti-Semite giving the commencement address at a tax-payer funded college. Even one of NY’s Democratic Party Senators Kirsten Gillibrand has turned against Israel…not because of anything the Jewish State has done but because she wants to appease the extreme leftists who have gained control of the Party of Harry S Truman.